This year our house turned 100 years old. Although we have lived here for only a short time, we have celebrated Thanksgiving, Christmas, New Year’s, Halloween, two wedding anniversaries, a Mendhi, many birthdays, and – as of recent – a Last Supper. With each occasion, a memory was created. We have been here long enough to recognize that the bones of this old home grow stronger and come to life with people – much like the Table will with each carving. We were honored to host the Apostles for a night of food, celebration, and reflection. After they left that night, Andre and I spent time gliding our hands over each mark and reading the message left behind at each place setting. We noticed that some marks were deep while others barely broke the surface; some were complex while others were minimal; some loud while others quiet. When we woke up the next morning we saw this beautiful table where we left it the night before, straddling two rooms and softly resting in the sunlight. When it was time to break it down to move to Grand Rapids we did so lovingly and with intent, reminding us very much of the way we prepared our first child to leave the hospital to come home. 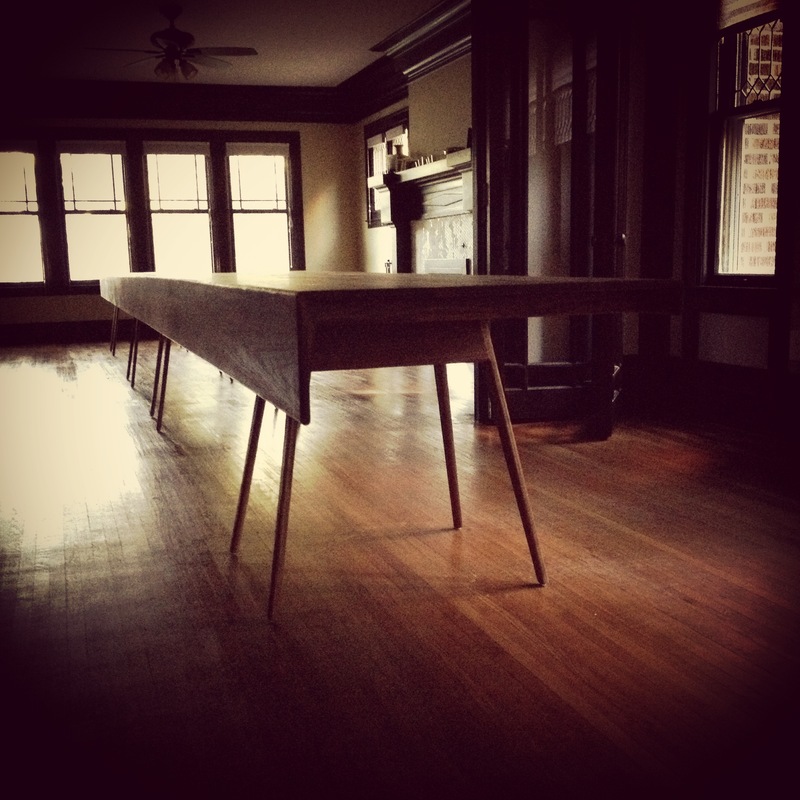 It’s been many days since we settled the piece into the Urban Institute for Contemporary Arts in Grand Rapids but every time we walk through our home, we are reminded of the day we had with the Last Supper Table – and we are humbled that it now rests in the hands of the thousands of people that will pass through ArtPrize. The seventh apostle, years ago, taught Andre and I that designers had a responsibility. 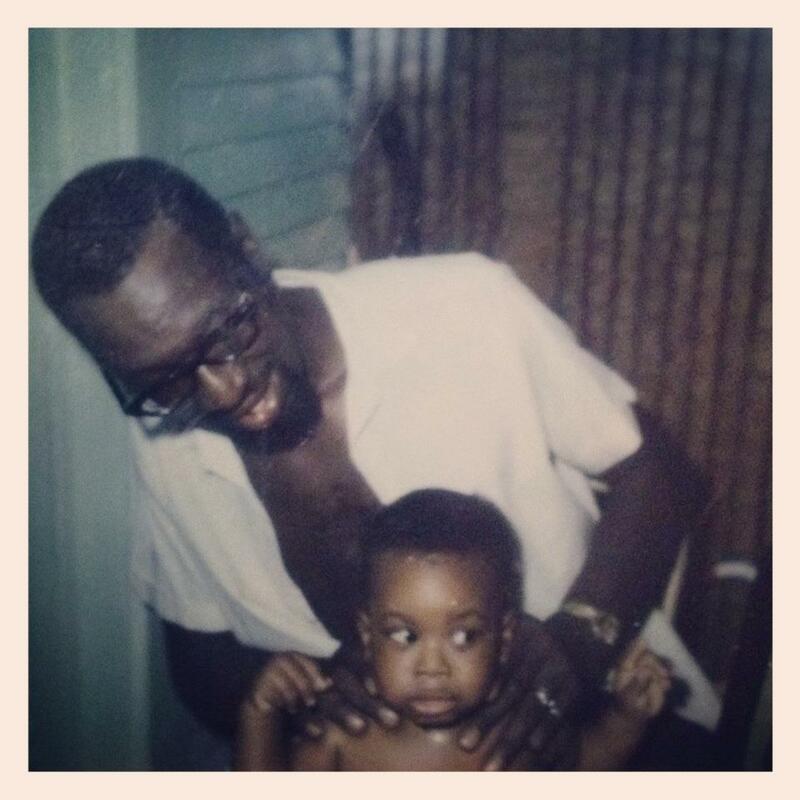 He challenged us to think deeply of certain words that were often thoughtlessly expressed: family, community, education, ideals, spirituality, and truth. He softly demanded a level of accountability with creativity. 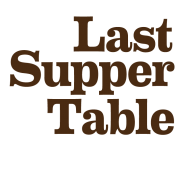 The Last Supper Table hopes to do the same. It offers itself to the public to thoughtfully mark their story – their struggle with forgiveness and trust. Leaving that mark can be challenging for many reasons. Beyond those that are personal, walnut is a hardwood that is not well-suited for carving. The choice in material is intentional and it demands a tool that can overcome its hurdles. As we built the table up, we also worked to understand how to take away from it. With the skill of Gabriel Craig from Smith Shop, we found a way to reshape an off-the-shelf masonry nail to suit this purpose. Apostle No. 7, it is with your support that the experimentation and production of the carving tools are possible. Apostle No. 7, thank you. As the Last Supper Table grew in its ambition, it grew in its need. Andre and I realized that design, art, craft, and storytelling needed capital; that capital required a strategy. We had pieces in our heads but were lacking the time and perspective to step away from the work we were so intimately involved in to just think. We wanted a dinner and we wanted twelve apostles but we struggled with how to best connect both while fundraising the amount the project needed. Although the number six is half-way to twelve, the sixth apostle appeared much earlier. And with the appearance of Apostle No. 6 came the clarity and perspective we needed to finalize our approach. Apostle No. 6 is connected to the structure of the Last Supper Table – the component of the table that hides beneath its surface that is critical to the support of its top and the connection to its legs. Similar to the table’s structure, this apostle is quiet yet critical. His presence at the Last Supper will be through a designated pair. Apostle No. 6, thank you. Things do not always go as planned. Andre and I know this well; Apostle No. 4 knows this well. What began as an Ali Sandifer custom commission for a communal table became a journey. Twelve weeks turned into one year. We replaced one piece for another – twice -learning some valuable lessons along the way. And then when we thought our design risks were mitigated, all were reminded that hardwood is alive and, given the slightest change in environment, will react. We crafted an alternative that was never installed and instead, after days on a new piece, remedied the original. Throughout that process, both sides were dedicated to making things right. Even with heartbreak and frustration, there was mutual respect and empathy. Rather than hide this story, we choose to celebrate it. Apostle No. 4, your support is applied towards the enormous storytelling that is a part of this project because the Last Supper Table has been an exercise in sharing many uncomfortable and vulnerable moments. We are so touched – and find it so fitting – that, along with your support, you have offered a contribution of wine to the Last Supper. Apostle No. 4, thank you. The Last Supper would not have been possible without the First Supper. Nearly one year ago, Andre and I shared a meal with friends at our home in Detroit. After a disastrous experiment with dinner, we settled into a conversation that was quite the opposite. It was, in fact, one of those rare moments when you realize the power of an accidental idea and the many forms it can take. Andre and Brian were from Grand Rapids; Lisa and I were not. Somewhere in the hilarity of ‘Grand Rapids talk’ – religion, race, biking, teenage anti-drug enforcement, high school rivalries (Ottawa Hills vs. East Grand Rapids), and football – was ArtPrize. It was in that mess of laughter that the Last Supper Table was conceived. In the months that followed, the idea of designing and crafting a Last Supper Table grew. Although born out of a light-hearted conversation, it spoke to us personally and we began to fall in love. Through private commissions at Ali Sandifer Studio, we had birthed a series of tables over the years and they kept growing in size to convene more and more people. With each one that followed the First Supper, we would revisit the idea of a table inspired by the Last Supper. When ArtPrize 2014 was announced, we had already decided to make this special project happen. After ten years of designing furniture for our own studio, we were ready to take what we had learned and step aside for a moment to enter a new territory of public art. The collection of thoughts on this blog will not capture all of our dreaming to date – and there has been a considerable amount of dreaming – but it will allow you to follow us as we turn this dream into a reality. This public platform is your invitation to join us for dinner.